First things first people- LESS IS MORE! Not all things hanging on a wall need to be artwork. 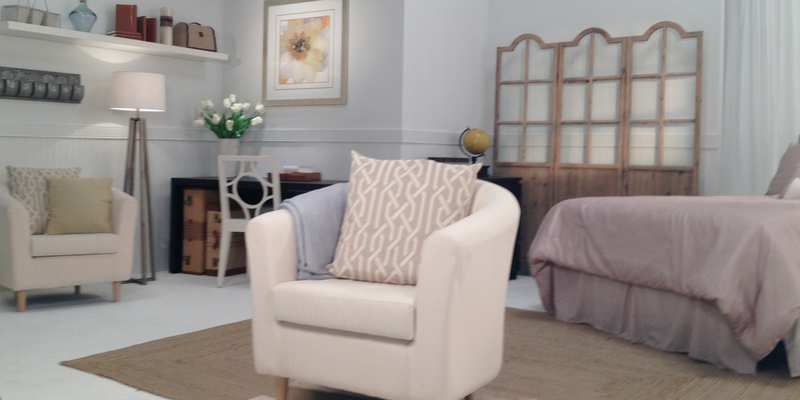 In the photo above we helped another set designer, at HSN, on this project. There is only one piece of artwork, but it is combined with other beautiful industrial pieces like clean shelving and storage containers. What do think about that neat wooden piece near the bed? It can be used as a room divider or as a simple backdrop. I love how this room came out- don’t you!? 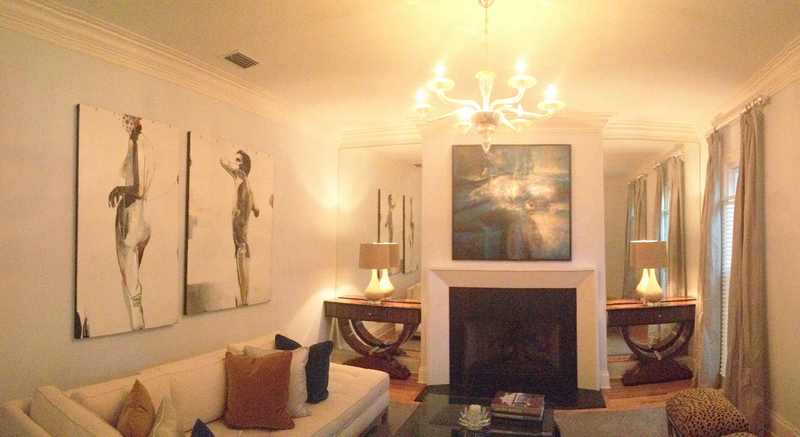 We had the privilege of working with this homeowner and the artwork is just amazing. And here comes my next little tip; please stop putting your giant black television over your beautiful mantle! Anything with dark tones tends to pull your eye in that direction, and if you have a giant over-sized television- dead in the center of the room, no one is going to notice anything else. People don’t realize that I was a former art teacher and a painter at heart, so artwork to me- makes the entire room, and this is the proof to that. I love the neutral tones of all of the blue’s and golden yellow’s in the room. The blue abstract painting pulls in the colors from the pillows and the abstract quality of the people in the artwork made a bold statement without distracting from the other beautiful elements. 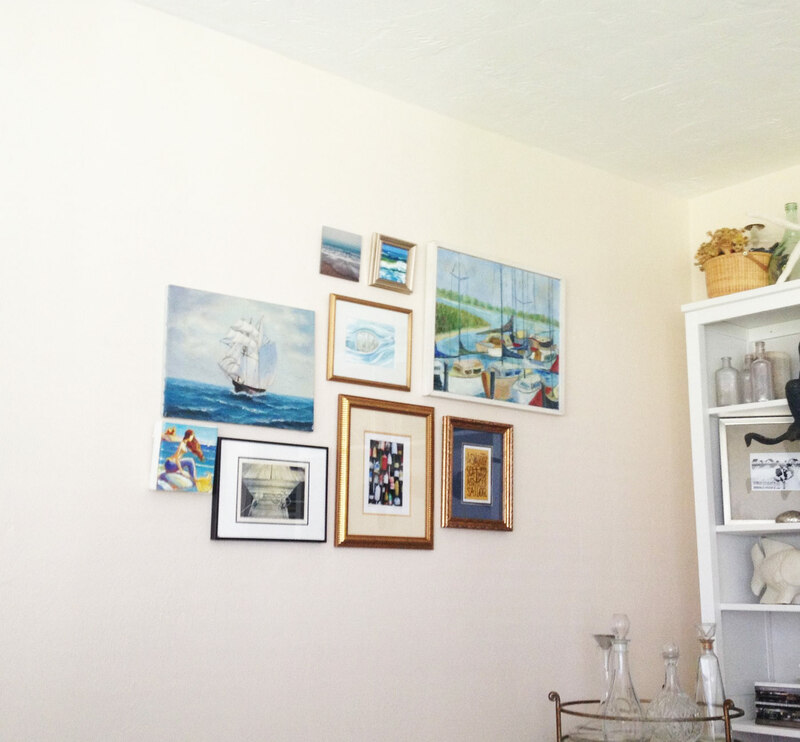 And last but not least; Gallery Walls!! As a dear friend of mine said, “My gallery wall looks like a weird shrine- its not what I wanted” and thankfully we were able to help her. Sometimes you have to break things up a little bit. If you’re looking to have a clean looking gallery wall, stick with the same exact frame in the same color, but mix up the prints or artwork inside. It creates better visual interest and you don’t get “bored” looking at it. If you want to get a little more bold with your look, mix up the frames – paint them or buy them all in the same color and it will still give you a nice uniform look, BUT stick with simple pieces of art for inside the frame. In the image above, we went really bold with all different frames AND types of artwork. The only reason this works is because of the color palette and the theme of each piece was nautical. I would recommend hiring someone to help you if you want to go this bold. If you’re getting lost, bring your room colors with you when you shop and it will help you get just the right look! Hope this advise helps! and Happy Hanging!! P.S. —> please always remember that artwork can be heavy, have someone to help you and also remember to use the right tools like a level, hammer, correct mounting on the artwork and well as another set of eyes!